Aluminum Trim | Salmon Bay Sand & Gravel Co.
Salmon Bay offers a wide variety of moldings and reveals, which allow the architect to transform common building conditions into attractive architectural details. 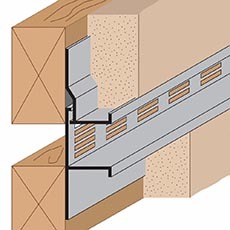 Stockton is a manufacturer of a full line of standard and custom extruded aluminum products for stucco and drywall. We offer radius shapes, intersections, vented/unvented, weep holes and key holes. Choose from a variety of industrial finishes. Plus a large selection of Fiber Cement Board moldings. Salmon Bay has a wide array of Stockton Products available. © 2019 Salmon Bay Sand & Gravel Co. All Rights Reserved.